Tune: "We Three Kings of Orient Are"
Cor-inth was a wi-cked place. Peo-ple e-vil a-s could be. And s-o dis-pleased was He. 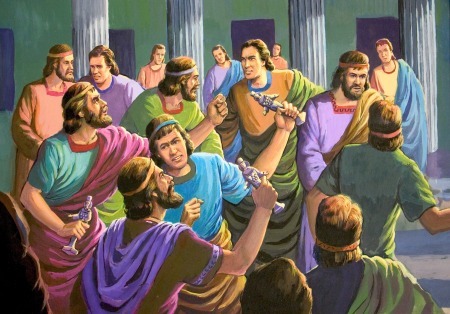 O-h, Paul preached to them. They be-lieved. Man-y peo-ple changed their ways. They were bap-tized, fol-lowed Je-sus. Paul would stay there man-y days. "I have man-y peo-ple here". For half a year and a year. O-h, Paul made tents with his good friends. They all served God in that town. Share the Lord with all a-round. Print lyrics "We Three Kings"
Hear the tune "We Three Kings" by John H. Hopkins Jr.
Press "Go" to search for books about Paul in Jerusalem.